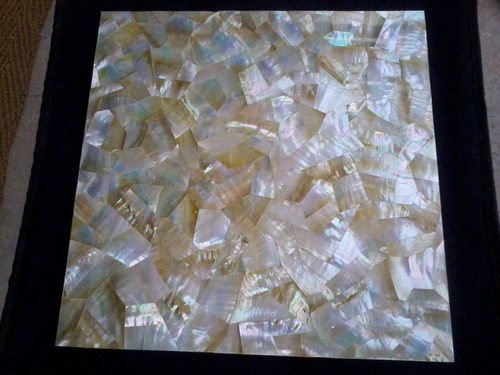 We are offering a wide range of Golden Mop Tile which is highly praised by the clients. This range is made using high end machines that provide Golden Mop Tile precise cutting and fine edges. Our range is available in the mixture of different color like semi-white and semi-golden that enhance the beauty of your walls. As well, our range is developed by the skilled and dedicated professionals who follow the norms and standards of the market. Besides, this range is applicable for wall and adds a charm to your place. Established in the year 2001, we are engaged in manufacturing, supplying, wholesaling and exporting a wide range of Crystal Wash Basin, Crystal Quartz Wash Basin, Wave Wash Basin, Twisted Wash Basin, Shell Wash Basin With Inlay, Crystal Plate, Talwar Crystal Item, Crystal Ball, Crystal Ganesh & Lakshmi, Skull, Black Skull, Red jasper skull, Skull Ring Stone Skull Earring Ring, Wooden Door, Wooden Temple, 3D Wall Panel, 2D Wall Panel, MDF Jali, MDF Window Jali and many more. While manufacturing these products, we ensure to use high quality raw material, which is procured from reliable vendors of the market. Therefore, these products are in compliance with all the international standards of quality. Owing to their high durability, smooth finish, classic designs and vivacious colors, these products are highly cherished by our clients. In order to enhance the beauty of various decors, we are also engaged in providing Marble and Wooden Inlay work. Moreover, we accept payments in flexible modes such as pay order, online, credit card, cash, cheque and DD, acceptable on terms like D/A and Western Union, in order to facilitate hassle free monetary transactions with our customers. To deliver our products in safe and sound manner, adhering to high quality standards, we make use of various shipment modes such as air, road and sea. Merits such as customized packaging, large production capacity and vast product line have aided us in mustering a huge client base across the Indian Subcontinent.